The exact amount of weight you can expect to gain during pregnancy will depend upon numerous factors. Your pre-pregnancy weight, height and how many babies you’re carrying will largely determine how much weight you can expect to gain. You’ll need to determine your BMI before you can see what’s considered normal weight gain during pregnancy. If you have a BMI of under 18.5, you can expect to gain between 28-40 pounds. If your BMI is 30 or over, you can expect to gain 11-20 pounds. It appears the higher your BMI, the less weight you can expect to gain. Obviously, if you’re carrying more than one baby, you can expect to gain more weight. The above are simply estimates of how much weight you should look to gain, but don’t be too concerned if you discover you weigh slightly more or less than the recommended guidelines. There are free online calculators you can use which will provide an estimate based upon your measurements. However, the most accurate way to determine how much weight you’ll gain is to chat to your doctor. Can I Prevent Too Much Weight Gain? If you’re worried you’re gaining too much weight, there are things you can do. Under no circumstances should you attempt to go on a diet. Your baby needs good nutrition in order to develop healthily in the womb. If you go on an extreme diet, or cut out any food groups, you’ll be putting not just your baby at risk, but your own health too. Some pregnant women find it useful to see a nutritionist. They can tell you exactly what you should and shouldn’t be eating. They can also help you to create a healthy, balanced diet to fit your individual needs. However, if you can’t afford a nutritionist, there’s plenty of advice online and your doctor will be able to give you detailed information on what you should be eating to meet your weight goals. In fact, it’s really important to avoid making any changes to your diet without first consulting your doctor. Remember, everything you put into your body gets passed onto baby. As well as ensuring you’re eating a balanced diet, you’ll want to make sure you maintain a gentle exercise plan. Again, only do this after being given the OK from your doctor. Many women assume they shouldn’t work out once they become pregnant. However, while plenty of rest is needed, exercise doesn’t need to be avoided completely. In fact, a little exercise can be really good for you and baby and help to prevent too much weight gain. Shouldn’t I Be Eating For Two? We mentioned eating a balanced diet is important, but it can be difficult to know how many calories you should be focusing on. It’s a common belief that you need to eat for two when you’re pregnant. There is some truth in this, but you don’t have to eat as much as you might think. It’s estimated you should eat approximately 300 additional calories when you’re pregnant. The number of calories you should be consuming will also depend upon which trimester you are. Again, this is a general guideline and your doctor will be able to tell you whether this is accurate for you. The main takeaway point here, is that you don’t need as many additional calories as you might think, even when you are eating for two. Is It Bad To Gain Too Much Weight During Pregnancy? Although your main concern might be how the additional weight gain will make you look and feel, what you might not realize is that it can actually be bad for you and baby. Firstly, you’ll be at a higher risk of developing conditions related to high blood pressure. If this occurs, you could end up having a preterm birth. Excess weight also increases the chances you’ll need to have a caesarean delivery and it can increase the size of your baby (which could make natural delivery even more painful). Being underweight can also be problematic during pregnancy. If you started out underweight, there’s a chance your baby could b born with a very low birth weight. This can affect their blood sugar levels, as well as make it difficult for them to feed. It’s also likely they may need to stay in hospital a little longer. If on the other hand, you started out your pregnancy being 50 pounds or more overweight, not gaining the recommended amount of weight throughout the pregnancy could actually lower the risk of complications. This doesn’t mean you should try to eat less however. Always follow your doctor’s guidelines to ensure your baby isn’t at risk from your dietary restrictions. 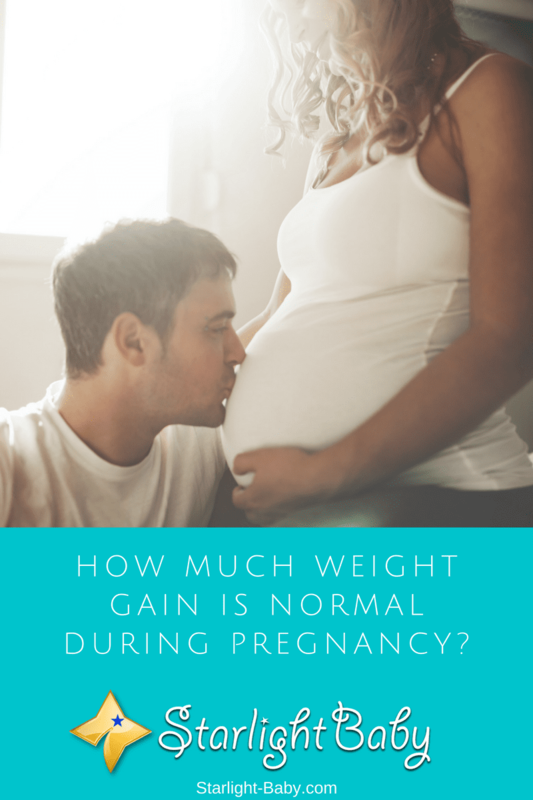 Overall, some weight gain is expected during pregnancy, but it does depend upon numerous factors how much you can expect to gain. Talk to your doctor and see what they suggest and if possible, you may even want to seek advice from a nutritionist. Pregnancy is another milestone is women’s life and achievement for couple. Alot of changes may happen during this stage and one of this is regarding about weight. It is important to have balance diet. Weight gain is normal during pregnancy but it should be in accordance to your body mass index (BMI).Overweight during pregnancy is risky, it might be the reason of complications such are high blood pressure and diabetes. These two are very common specially at the age of 35 above. It is highly recommended to check with your OB GYNE and for further weight concerns don’t hesitate to consult your dietician and nutritionist. Yes, sweetpot81, it’s risky to gain too much weight when pregnant because of the illness you mentioned. A high blood pressure can lead to pre-eclampsia and could be fatal to both mother and baby if not addressed. My eldest sister had this pregnancy risk when she got pregnant with her two boys so the doctor advised her to not have any more kids because it could cost her life. Internet plays a vital role nowadays, with this we’re able to learn and know more without going to school. It gives us information that could prevent a certain situation or case before it gets worse. Aside by the internet are those who love and passionate about writing articles like this. It’s takes time, alot of research, interview, and experiences that leads them to have a productive, informative and reliable article like this. Thank you. Such an informative article on how pregnant mothers can really control their weight when they are pregnant. I have seen those that went on diet and to be honest, I always thought that it is a good plan not until I read this article. I’m glad for opening my eyes on how mothers should eat while they are pregnant. We’re really glad you now have a better understanding about pregnancy, Henrywrites. Most moms do not really intend to grow big but pregnant women tend to feel hungry most of the time because they’re eating for two, but sometimes, they overeat thus the weight gain. Some get to shed the extras, others are not that lucky. I don’t really think most moms should worry much when they are pregnant unless they won’t have that desire to train after delivery of the baby. Working out at the gym can be an effective way to lose weight as well. The body goes through a lot during pregnancy with regards to change and gaining weight is the most common amongst all, although I’ve so many women who never gained weight during pregnancy. It’s good to know that weight gained during pregnancy has its ups and downs. I’ll be sure to share this article with my wife since we plan on haha baby pretty soon. You’re right, Rumu, weight gain is one of the most common changes a pregnant woman experience. Some, however, are lucky to not gain weight at all while pregnant and they stay fit and fabulous after giving birth. Unfortunately, this is not true to a lot of women. Sometimes, the weight problem is also due to genetics. Eating habits, the food we eat and exercise will determine if a woman can gain back her pre-baby body after delivery. You have to be supportive and understanding as well while she gets back in shape because it is not easy. It’s also important note that entering the pregnancy in a healthy state in which you’re already practicing regular exercise and good eating habits can give you a better advantage during your pregnancy. If your fall back snacks are kale chips instead of potato chips, then getting those extra calories in as the trimesters go on will be nutritious for both you and your baby and make those pounds fall off easier after the birth. Personally speaking though, I hope I can make it through the change self-image during pregnancy. I’m worried watching myself gain 28-40 lbs might bring down my self-esteem. Ultimately, I have to keep telling myself it’s for the baby! Eating healthy is truly the key to preventing too much weight gain during pregnancy. Pregnant women should watch what they eat because it could affect the baby especially if the food is unhealthy like junk foods. Doctors do not recommend this type of food as well as sodas and coffee when you’re pregnant. One has to have self-discipline and must remember that all of the sacrifices are for the baby so he/she will become healthy. Well, when I was pregnant for the first time I only gained 22 pounds. I never really tried not to gain weight nor did I put too much thought into it since my main goal was just to make sure that the child is alright. I knew that if you aren’t eating properly and well that it might have some consequences on the unborn. Now, I’m pregnant again and it’s around the same. I think that my weight gain is normal since you are technically eating for two. Plus, I don’t spend my time worrying because you can easily lose the pounds after you gave birth. You’re a lucky girl if you’re able to lose the extra pounds easily. Good for you! As for me, I also gained very minimal weight when I got pregnant with my kids. In fact, I was skinnier as compared to my body when I’m not pregnant so my tendency was to eat because I was not gaining weight. In fact, my OB-Gyne for my last two kids told me to eat more because my babies were small, she said. It’s after giving birth that the weight gain actually starts because I got used to eating more than I was supposed to. Weight gain appears to be one of the main concerns for women when they are pregnant. Rather than going through these worries alone, however, I believe it’s best to consistently visit a trustworthy doctor who can help you through this process and ensure everything is flowing smoothly. It’s not uncommon these days to see many communities worrying about women continuing to exercise and lead a healthy life while pregnant, causing them to maintain a slim figure while pregnant. This does not imply, however, that these women are not ensuring that they are consuming the correct amount of calories to keep the baby healthy. We cannot know how someone is living their life through a picture posted on social media. The most important thing is to pay attention to the tips mentioned above and remember to see a doctor. I totally agree with you about regularly seeing a doctor. Doing so ensures the mother and her baby are healthy. I’ve heard of stories about women dying or babies dying during childbirth because the mother never went in for a pre-natal check-up, or if she did, it was only once or twice. Incidents like these could have been prevented if there was a regular check-up. And yes, eating healthy and exercise are the key to maintaining a good body weight while pregnant. From experience and observations, it’s obvious that there is no running away from gaining more weight when pregnant. With the child in the women’s womb growing on daily basis, the woman’s weight is bound to increase as her pregnancy reaches closer to delivery. Also, from the excessive consumption of food by the woman would definitely add to her weight no doubt about it. Some women prefer to call it eating for two and eating just about anything they get the wind of and enticed by it. Pregnancy is not an easy thing at all, but anyways this is a nice article. Yes, pregnancy is not an easy thing. A woman is bound to suffer in one way or another. However, there are some lucky ones who never gain too much weight during pregnancy and could easily go back to their normal body shape in no time. But for most women, I guess weight gain and the inability to shed off the pounds is a continuing struggle. Thank you for this guide. As someone who is overweight to begin with, I figured I could expect less weight gain with a pregnancy than someone in better shape, but I wasn’t sure how much would be considered normal. This is really very helpful. I was told that a pregnant woman should gain at least 10 kg weight in the 7-8th month. This 10 kg weight increment in the 7th, 8th month is very normal. If your weight gain is less than 10 kg, the pregnant woman should start eating more, if the weight lain is more than 10 kg, you should be worried. When you gain more weight, there will be a difficulty with normal delivery and you have to go to C section.